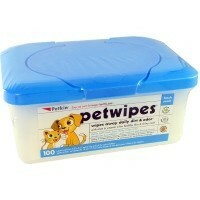 Petkin PetWipes 100 Pack is a pack of handy wipes contained in a handy tub that provide you with a quick and easy solution to cleaning your pet. Containing natural ingredients for added cleansing, these wipes help to soften and condition your pet's coat while removing all the dirt and loose hair. With a pleasant fragrance too, these gentle wipes take away those horrible odours to leave your pet looking and smelling beautifully fresh. Safe to use daily on both cats and dogs, these large wipes measure 7.5" x 6.7". Extra big and extra thick. These wipes are perfect for my Jack Russell terrier, Strong and not to small, although he probably doesn't like to smell so nice. Great Product, they do exactly what they say and the sheets are quite large.